Derby clinched top seed on the west side of Class 6A with a 35-21 win at Maize. The Panthers raced out to a 21-0 lead in the second quarter thanks to a long touchdown run by Tre Washington, and two Hunter Igo scoring runs. Maize pulled to within 21-7 by halftime on a Caleb Grill 1-yard run. Grill added a second short touchdown QB sneak in the third quarter to pull the Eagles within 21-14. But Derby would answer with Washington’s second touchdowns put the Panthers up 28-14. Grill then hit Jordan Helm on a 25-yard touchdown pass to again pull Maize within one score, but Igo’s third touchdown of the night pushed the Derby lead back to two scores. Maize threatened late with a goal-to-go situation, but Derby’s defense stiffened and held the Eagles out of the end zone. 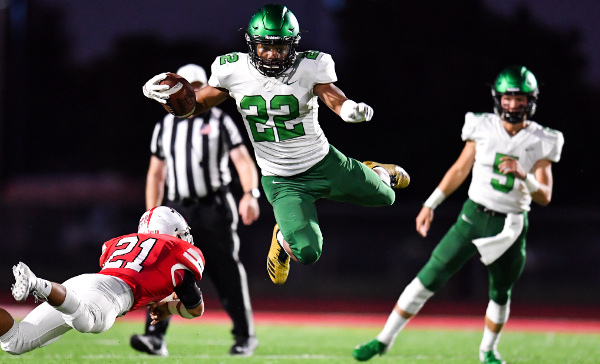 That stand proved to be significant in earning the Panthers the top seed as Derby finished seven district margin points ahead of Lawrence Free State in determining the No. 1 seed on the west side of Class 6A. The loss dropped Maize to the No. 2 seed on the west side of Class 5A. Louisburg claimed the Frontier League title and the overall top seed on the east side of Class 4A with a dominating 25-7 win at Paola. Both the Wildcats (8-0) and Panthers (7-1) entered Friday’s showdown as the top two teams on the east side of 4A. Fifth-ranked Louisburg got on the board early with a 25-yard touchdown pass from Madden Rutherford to Blue Caplinger for a 7-0 lead. The Wildcats then recovered a Paola fumble, but could not convert the turnover into points. Louisburg scored twice in the second quarter to take control. Rutherford connected with Brayden Gage on a 38-yard score to push the lead to 12-0. Then, late in the second quarter, Caplinger completed a throwback touchdown pass to Rutherford from 8 yards out for a 19-0 lead. Caplinger, a former quarterback in the Louisburg system, made the change to running back when Rutherford took over as the quarterback last season. Paola showed some life right before halftime as quarterback Seth Richmond hit Corbin Gant on a 79-yard touchdown pass to pull within 19-7. But that is all the closer the Panthers would get. Louisburg added a short Rutherford touchdown run late in the third quarter for the 25-7 win. Kaleb Hammeke tossed a 30-yard touchdown pass to Isaac Miller with a minute left to lift Hutchinson Trinity Catholic to a 26-22 win over Chaparral. The victory made the Celtics the runner-up of District 6, while Chaparral settled for third place. Trinity jumped out to a 14-0 lead before the Roadrunners score twice on two Jake Burke touchdown runs to tie the game at 14 at halftime. Burke scored again late in the third quarter to give Chaparral a 22-14 lead, but Trinity would respond as Hammeke’s 16-yard touchdown pulled the Celtics within 22-20 with three minutes left in the game. Just two minutes later, Hammeke hit Miller for the game-winning score. Trinity Catholic opens the Class 2A playoffs at home against Belle Plaine, while Chaparral will travel to Fredonia. Pittsburg and De Soto combined for 63 points in the first half, but the Purple Dragons eventually took control for a 49-35 victory. Pittsburg senior receiver Dylan White scored three touchdowns in the first quarter as the Purple Dragons built a 28-14 lead. White caught two Ty Roark touchdown passes and returned a punt for a score in the opening quarter. De Soto seemingly had an answer each time in the first half. Tyson Priddy scored from 27-yards out, and, after a Pittsburg fumble, Jackson Miller connected with Keegan Sturdy on a 37-yard touchdown pass in the first quarter. Russell Coy’s short touchdown run pulled the Wildcats to within 28-21 in the second quarter, but Pittsburg would answer with a 1-yard Brandis Evans touchdown run. De Soto scored late in the half on a touchdown pass from Miller to Hayden Henderson to pull within 35-28 at the half. The scoring slowed some in the second half, but Pittsburg tacked on a pair of touchdowns to lead 49-28 before Coy scored late for the final margin. Pittsburg earns the No. 4 seed on the east side of Class 4A, while De Soto will be the No. 2 seed in the 5A East bracket. Smith Center scored on a 1-yard Hesston Maxwell touchdown run with 25 seconds remaining to overtake Ell-Saline, 15-8. The Redmen led the game 7-0 for nearly three full quarters before Ell-Saline’s Nick Davenport rushed for a two-yard touchdown with :14 seconds in the third quarter. The Cardinals then added the two-point conversion for an 8-7 lead. That one-point lead almost stood up. Smith Center drove inside the Cardinal 10-yard line with four minutes remaining, but Ell-Saline got a fourth-down stop. The Cardinals couldn’t mount a drive to run out the clock, however, and had to punt back to the Redmen with two minutes remaining. Maxwell then pushed across the winning score from a yard out. Ness City rallied from down 20 points to top second-ranked Hodgeman County, 28-26. Early on, it looked like the Eagles may be in trouble as the Longhorns scored on their first three drives to build a 20-0 lead. Ness City pulled to within 20-8 at halftime as John Pfannenstiel hit Easton Seib on a touchdown pass in the final three minutes of the second quarter. In the third, Pfannenstiel’s two-yard run pulled the Eagles to within 20-16. Then after a turnover, Pfannenstiel hit Landon Reinhardt on a 24-yard touchdown pass to give Ness City its first lead at 22-20. Hodgeman County would answer right back with an Eli Salmans touchdown to regain the lead, 26-22, but the two-point conversion was unsuccessful. The Longhorns then picked off a Pfannenstiel pass, but could not convert the turnover into points. Pfannenstiel then hit Seib on a 34-yard touchdown strike with 5:30 remaining to put Ness City up, 28-26. Hodgeman County would mount a final drive to the Ness City five-yard line, but on 4th-and-1, Isaac Salmans was ruled just short of the first down marker and the Eagles took over with :50 seconds remaining. Pfannenstiel passed for 176 yards and three touchdowns to go along with a rushing touchdown. Eli Salmans led Hodgeman County with 49 carries for 270 yards and three touchdowns. Congratulations to the Eureka Tornadoes for their 27-13 win at Cherryvale on Friday night. With the victory, the Tornadoes (3-5) finished as the fourth-place qualifier from District 5 and earned a playoff berth for the first time since 2013. On Friday, Eureka shut out Cherryvale 13-0 in the second half to preserve the win. Quarterback Cade Burden passed for 198 yards and three touchdowns in the win. Burden threw touchdown passes to Zach Hare, Justin Zimmers, and Bradley Bohl. It’s quite an accomplishment for first-year coach Jason Nichols and the Tornadoes who have played every game this season on the road after an actual tornado damaged the Eureka football field earlier this summer. Their reward for reaching the playoffs? A road trip to state-ranked Conway Springs next week! Altoona-Midway earned its first playoff berth since 1992 with a 36-20 win over Colony-Crest on Friday. The Jets have won just twice this season, but those two district wins were good enough to finish fourth in Eight-Man, Division II, District 1.